The Microtech Tachyon III reflects the ideal evolution of Microtech's balisong line. 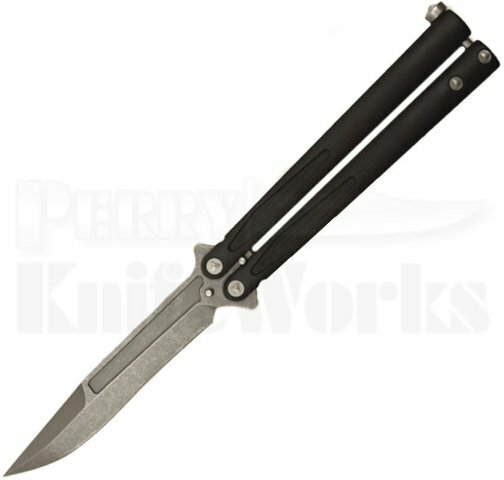 The new Tachyon III is a gorgeous, full-size butterfly knife with an extremely solid build and a totally refined look. The Microtech Tachyon III, sets itself apart from previous models with milled, one-piece channel construction handles, a spring latch, and a standard pocket clip. The Elmax steel blade showcases a non-sharpened swedge-ground tip and milled grooves with the Microtech logo, production date, and blade steel markings up front. Microtech Tachyon III 173-10 Stonewash --- Available Here! Microtech Tachyon III 173-10AP Apocalyptic --- Available Here!